I have often wondered what the grungy gray gunk that filled my humble remora skimmer cup could be. It was frothy on the top, liquid in the center, and sludgy on the bottom; all of the characteristics of my favorite iced mocha really, yet far from the same flavor. It really has multiple textures and a plethora of funky-fresh smells. So what could this disturbingly pungent pool of excrement really be? Luckily, I have wicked sweet google skills and there are chemists out there that love to get their hands dirty. Ken S. Feldman published a brilliant study breaking down the exact components of skimmate titled Elemental Analysis of Skimmate: What Does a Protein Skimmer Actually Remove from Aquarium Water? This exceptionally detailed study can be found by visiting our friends at AA. I recommend checking it out if you really want to understand Ken’s genius, but if you are more into the cliff notes version read on. Skimmate is composed of less organic material than one might guess. In fact only 34% of the skimmate was organic material or fishy number twos. Now clearly, this breakdown is very complex and most of us will never understand it, but it can be used to truly impress our fellow reefers at our club meetings, so use it wisely! If life deals you lemons, why not kill some aiptasia with them. About a month ago, we added an article about Aiptasia Removal Methods. Well, hopefully, you don’t have any left, but just in case, here’s great way to rid yourself of this nuisance anemone. Basically, what’s involved is injecting each aiptasia with lemon juice. The acidic nature of lemon juice will kill the anemone, and prevent it from further reproduction. At one point or another, most hobbyists encounter a time when a fish is suffering beyond the point of possible revival. The question as to the most humane method to euthanize this fish often arises. While there are several acceptable methods, we prefer using clove oil. 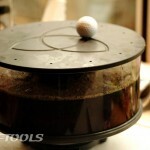 Place the fish in a container of tank water at room temperature, and place the sick/suffering fish in this container. In a separate, smaller container, mix a solution of a bit of water and 3 to 4 drops of clove oil for every pint in the holding container. Add this mixture to the holding container; this will be used as an initial dose, and will begin the process. The addition of clove oil to the water, slows down the fish’s breathing, and slows places the fish in sleep-like state. At this point, you may add 3 or four more drops directly into the holding container. This will continue to slow down it’s breathing. After a about 30 minutes, you may add 3 or 4 more drops of clove oil to the container and continue to observe the fish for up to an hour or two. The fish should continue to slow down, until ultimately passing away painlessly. A FEW WARNINGS, PLEASE READ!!! Please take care with the doses and be patient in order to allow the clove oil to slowly perform it’s task. Please keep Clove oil out of reach of children as it can be toxic. Please dispose of the fish properly since clove oil can be dangerous to other animals if consumed. I recently read about a very unique approach to flawless water conditions titled Two Times Five Equals Success, by Scott Fellman. The concept is exceptionally simple and demands very little from the hobbyist. Change FIVE percent of your aquarium’s water TWO times per week and you will gain stability and save money on additives. 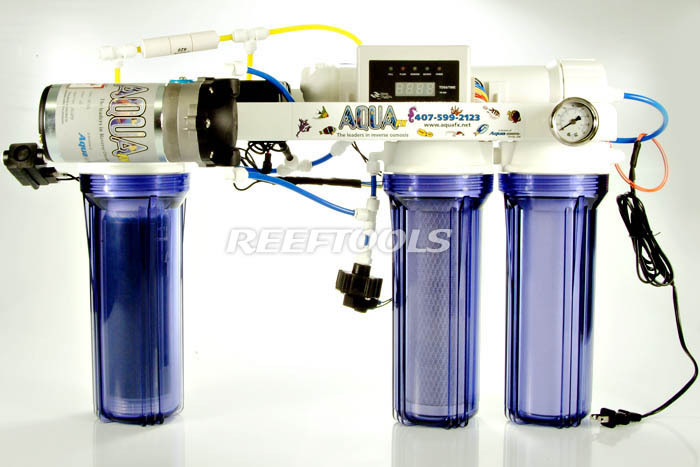 If you really think about it, we have all been drilled by every advanced hobbyist to change 20% of our water on a bi-weekly, or monthly for the lackadaisical reefer. This seemed to work fine, yet we all would still fall victim to organic waste/protein buildups and depleted trace elements. So is this the way to avoid potential crashes and have beautifully harmonious environment? I think so. 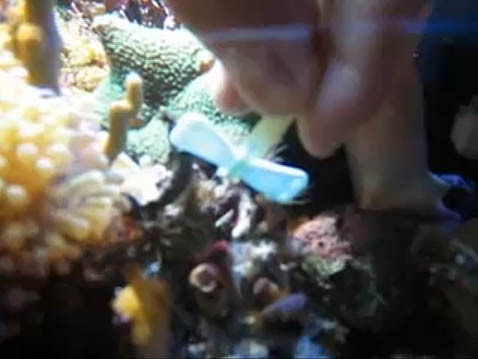 I challenge all of us to try this method of quality control for two months and record the findings on the Parameter App featured on www.reeftools.com/live I have a feeling you will be surprised by the lack of nitrates, phosphates and nuisance algae, not to mention the lack of visible detritus. 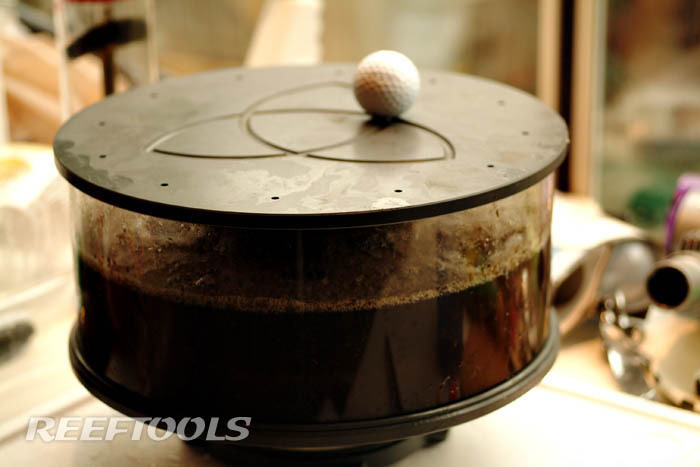 The entire process should take less then 10 minutes and save you tons on chemical additives. In addition to this little challenge, you could really take the time to go above and beyond and recommit to your mini-ocean. 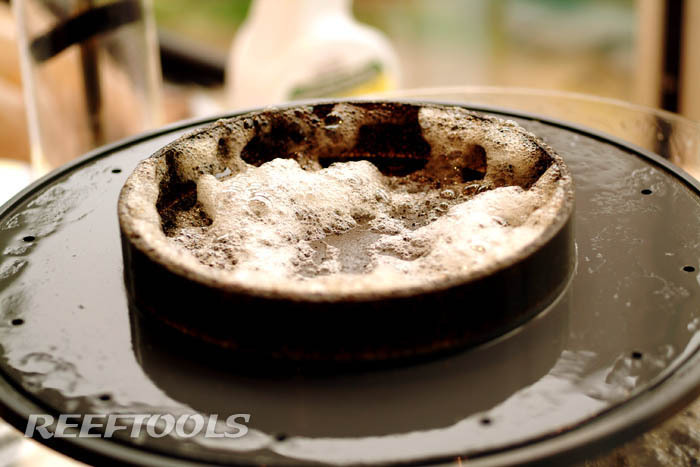 Change out or clean any filters, collection cups, and media and I am certain that you will find absolutely brilliant results. The environmental consistency of the water will become predictably flawless. What do you have to loose other than a few minutes of internet reefing? You’re tempted aren’t you? The benefits of such regimented practices will become apparent rather quickly. In addition to saving some green, not loosing stock to poor water conditions, and advancing your skills; your fish will be brighter, more alert, eat more, and perhaps even take a little time to bump fins if you know what I mean. This system seems genius and huge props to Scott Fellman for inspiring us to work smarter not harder. 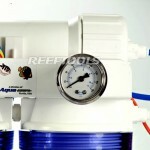 We had a chance to look at the Octopus, AquaFX first release in a line of Green and Efficient RO/DI units. 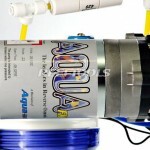 As with all AquaFX units, this line is made, tested and supported in the US. Out of the box, the AquaFX Octopus is truly impressive. The sheer number of gadgets and gizmos that come with this unit are sure to make any hobbyists smirk. 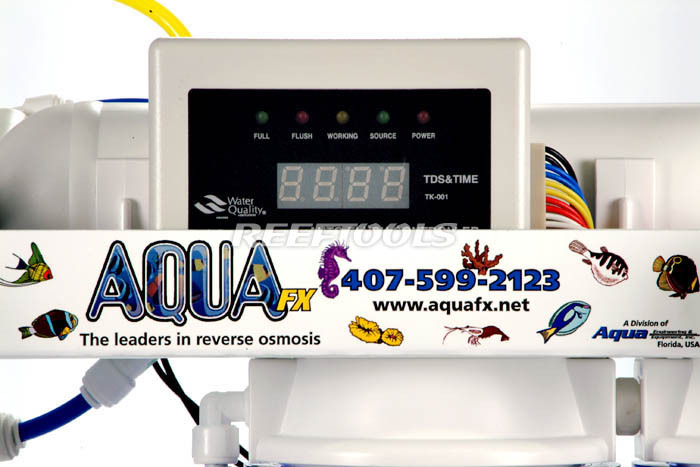 First and foremost, the Octopus boasts a microprocessor-controlled 1:1 waste water ratio. 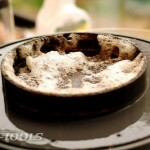 Long gone are the days of wasting 3, 4 or even 5 gallons of water for every precious clean gallon. 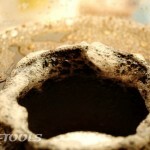 Although some hobbyists have found uses for this waste water, the truth is that most of use simply dump it. 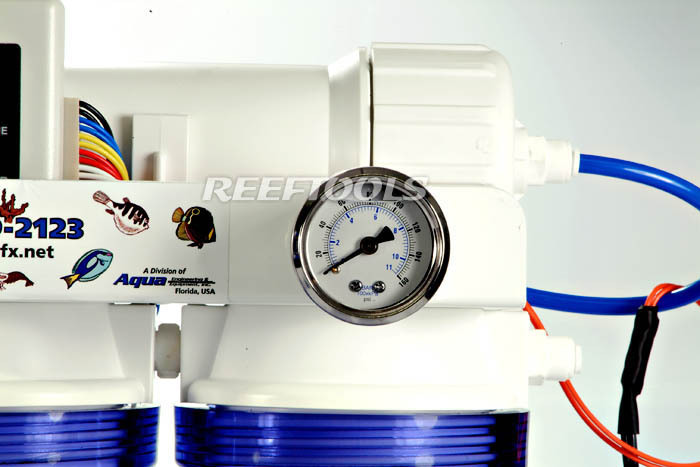 Next, the Octopus sports a high pressure, bracket-mounted booster pump, which is located POST pre-filtration. This design will extend the life of the pump, since the water flowing through it is already free of most large particles. The Octopus also features extended DI life via an automatic Membrane Flush upon start-up. 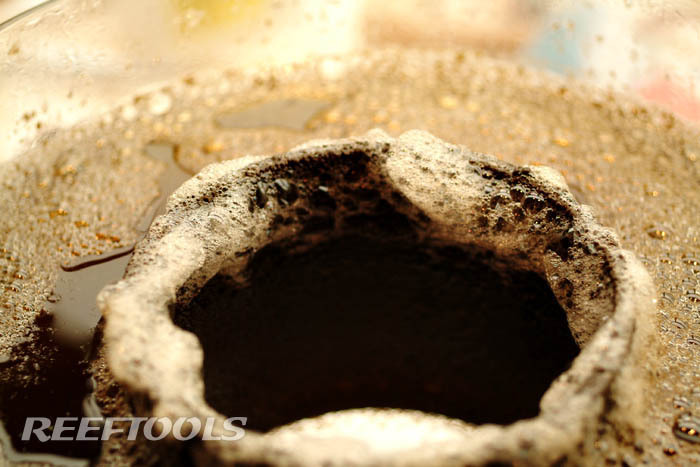 This TDS Creep flushing, is designed to prolong the life of the DI resin. A complete membrane flush upon shutdown, will help prevent membrane scaling. 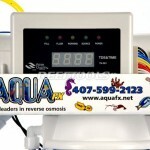 Another great feature of this new RO/DI unit by AquaFX is the build in TDS meter. You no longer need to use a hand-held model to measure TDS levels of the output. Finally, the Octopus has both High and Low pressure kill switches, which protect the pump and facilitate complete system automation. Basically, the Octopus is jam packed with just about anything a hobbyist could possibly want from an RO/DI unit. The Octopus is set up for the greatest filter life, with the least amount of waste! 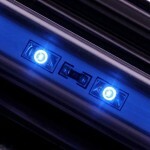 With a price tag of just $389.00, you can start going Green right now! 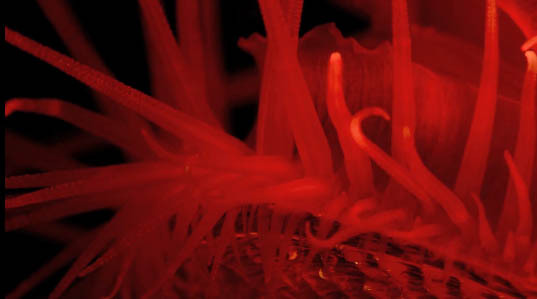 This amazing HD video by the gang at Coralmorphologic features a flame scallop, or Lima scabra. This filter feeder, siphons water through it’s fleshy mantle (similarly to a giant clam), strains any items of nutritional value, then expels the water back out. The flame scallop maintains it’s position with the help of “byssus threads” formed by a viscous protein secretion. The flame scallop is capable, however, of swimming away in the even of an attack by a predator. Click here to read the complete article by Coralmorphologic. The new IceCap LED Moonlight Retro kits are really fun! 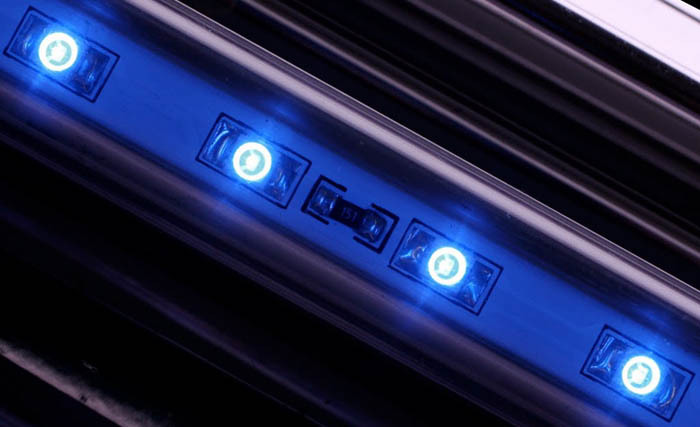 Sporting the same look as a standard T5 bulb tube, these new LED tubes are powered by a low voltage transformer rather than a fluorescent ballast. 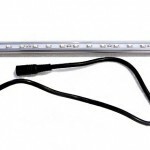 IceCap chose to enclose the LEDs in a tube, which not only provides ample spread, but protects the circuit boards from the humid, salty environment that can be so harsh on some aquarium lighting brands. 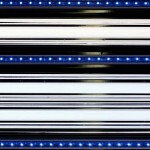 LEDs are usually favored for their low energy consumption, long life span, and low heat emission. 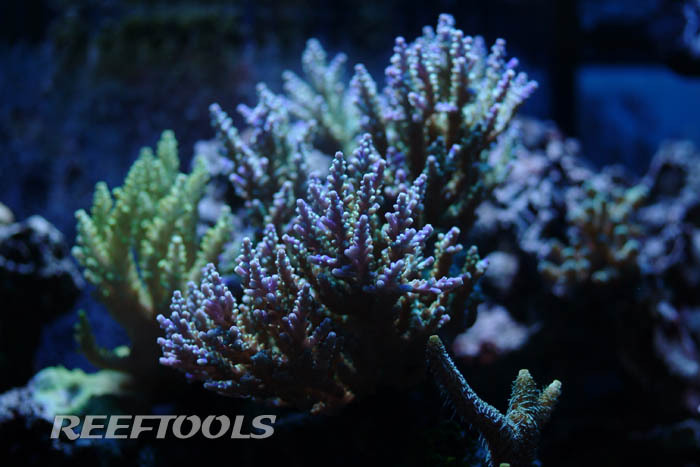 And while those are all true with the IceCap LED Moonlight tubes, the crazy colors they bring out in corals is where their true appeal lies. We’ll post some photos and perhaps a video in a follow-up article, so for now, you’ll just have to take our word for it! All we have to say is that we couldn’t stop staring. The next day, we all waited for the T5’s and Metal halides to go off, so that we can inspect the tank under this great new light. The colors were truly outrageous. 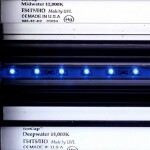 Actinics simply get blown out of the water by these LED Moonlight Tubes. 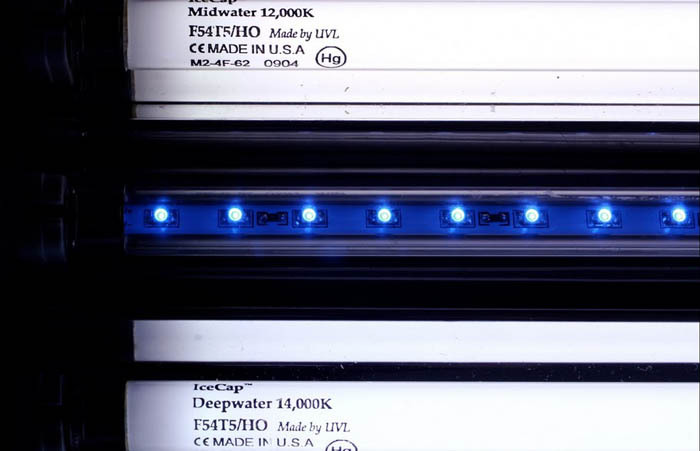 The IceCap LED Moonlight Retrofit kits ship out complete with mounting clips which can be used to attach the tubes to a canopy, hood, or existing fixture. 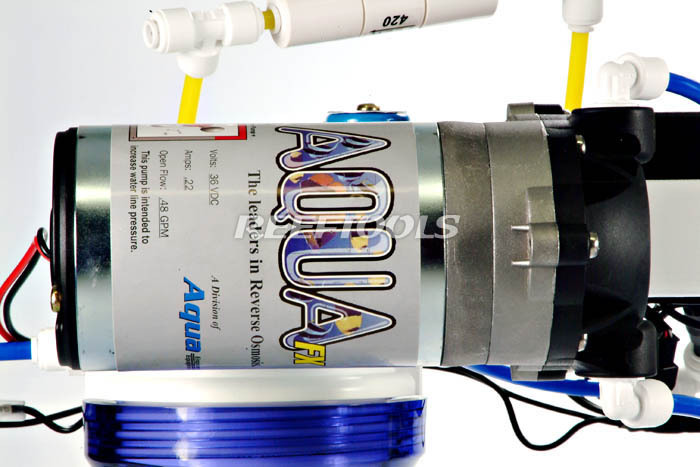 The heat negligible emitted by the tubes is dissipated by the aluminum heat sink on the back of the tube, and at only 4 oz., you don’t need to worry about any added weight to you existing aquarium lighting scheme. 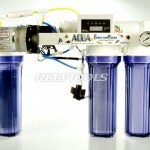 There has been a lot of focus lately on sustainable aquarium livestock harvesting and responsible aquarium keeping. The Catalina Goby, Lythrypnus dalli, is one fish notorious for being kept in inappropriate captive conditions. 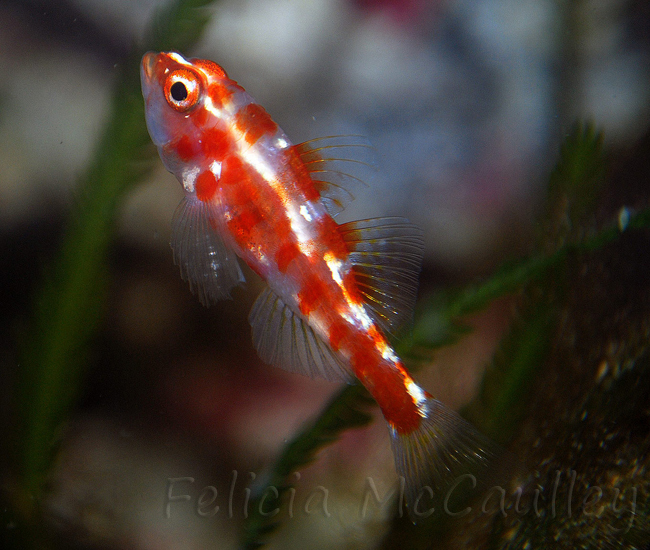 For years Catalina Gobies were marketed as tropical fish and sold to reef aquarists. 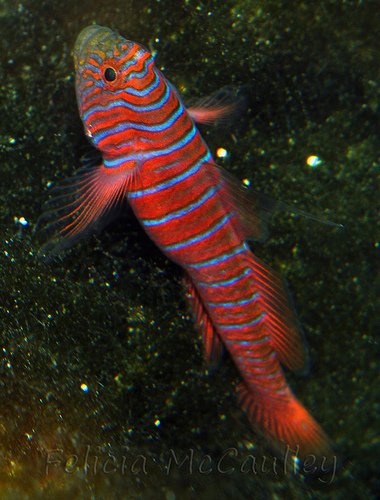 When the gobies died shortly after purchase, it was assumed that they were delicate or had very short lifespans. Neither assumption is true. Catalina Gobies are not tropical or sub-tropical fish. They are temperate, cold-water fish and quite hardy, if kept in the correct environment. The maximum temperature to plan for in a home Catalina Goby aquarium should be no more than 65 degrees Fahrenheit, maintained by a reliable chiller. Some retailers are beginning to notice that their customers are educating themselves about the habitats of the species they are keeping. These retailers have changed their recommendations for Catalina Gobies and other cold water livestock, admitting that they are truly temperate. But some are still recommending the incorrect maximum temperature of 74 or 72 degrees Fahrenheit, which are still tropical temperatures. It’s a step in the right direction, but this temperature recommendation is still way too high. According to fishbase.org, the maximum water temperature Catalina Gobies can be found living in is 71 degrees. This is during the hottest point in summer in shallow water. Keep in mind that our reef fishes can be found in waters where the temperatures reach more than 90 degrees during the summer. Even the least responsible aquarist would never attempt to keep reef fish at those temperatures. 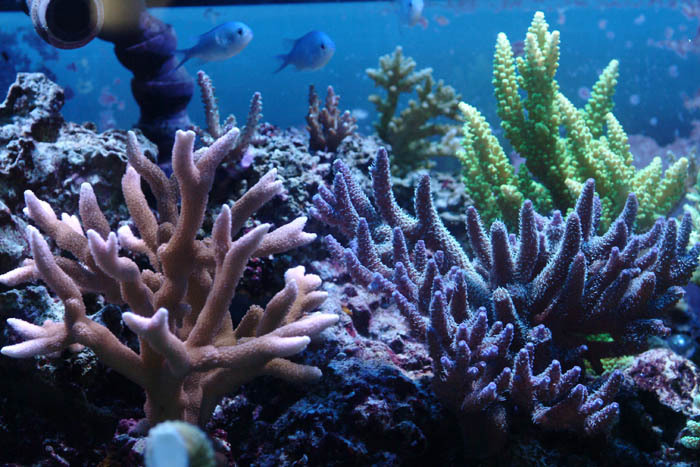 Our aquariums and captive reefs are very different from our pets’ natural habitats. Oxygen levels decrease at warmer temperatures, metabolism and respiration increase, and diseases/parasites can reproduce unchecked by inadequate dilution and overstocking (compared to the ocean). Attempting to keep any fish at the very top of its natural temperature range is going to shorten its lifespan and weaken the immune system. 71 degrees happens to be the top of a Catalina Goby’s temperature range. Public aquariums have known for years that Catalina Gobies must be kept at low temperatures. The Monterey Bay Aquarium houses Catalina Gobies in a chilled aquarium maintained between 58 and 60 degrees. Their Catalina Gobies’ average lifespan is 2 years and they have no problems with disease. The Steinhart Aquarium in San Francisco keeps their Catalina Gobies at 60 degrees. 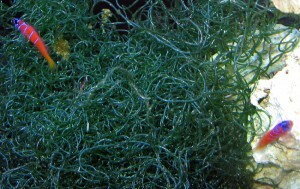 There are a few more species in the Lythrypnus genus, but only two show up in the aquarium trade with any regularity. The other is the Zebra Catalina Goby, Lythrypnus zebra. This species is not often collected, and the few that make it into the aquarium trade sell quickly. Not much is known about it except that its care is similar to the Catalina Goby’s. There have been reports of Zebra Catalina Gobies being truly tropical because it ranges as far south as Clarion Island in the Revillagigedo Islands. The same argument could be made for its preference for cold water, as it ranges as far north as the cold waters of Caramel Bay, Central California. In fact, Zebra Catalina Gobies share most of their range with Catalina Gobies; the two species are often found living in the same area. Fishbase.org lists L. zebra as sub-tropical, and L. dalli as temperate. It may be true that Zebra Catalina Gobies may tolerate slightly warmer temperatures than their cousin L. dalli, regardless, they should not be subjected to tropical temperatures in captivity. I received this adult Lythrypnus zebra as a gift in September 2008. My aquarium temperature is maintained between 67 and 69 degrees in fall, winter, and spring. During the hottest summer months, I use a chiller to keep the temperature below 72 degrees. 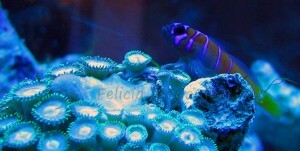 My Zebra Catalina Goby’s color began to fade as the aquarium temperature reached 72 degrees last summer. I turned the temperature down to 70 and it survived until the end of December 2009 when my aquarium “crashed.” Based on my experience with the handful of L. zebra I’ve worked with, I would consider L. zebra to be more delicate than L. dalli. Responsibility begins with the collectors, wholesalers, and retailers, but we as hobbyists have a voice every time we purchase a specimen for our aquarium. We can educate fellow hobbyists about cold water livestock and avoid the temptation to keep them in our tropical aquariums only to enjoy them for a short time. By avoiding difficult to keep species, we can decrease demand for these animals, and fewer of them will be collected. We all play an active role in the future of our aquarium hobby.